. . .Fritz reached her side before she had got her breath again, and poked his head out beside hers. There, in the faint starlight, they saw a bulky man, barefoot, half dressed, chopping away at the white post that formed the pedestal of the dove-house. The startled pigeons were croaking and flying about his head, even beating their wings in his face, so that he struck at them furiously with the axe. In a few seconds there was a crash, and Wunsch had actually felled the dove-house. "Oh, if only it is not the trees next!" prayed Paulina. "The dove-house you can make new again, but not DIE BAUME." They watched breathlessly. In the garden below Wunsch stood in the attitude of a woodman, contemplating the fallen cote. Suddenly he threw the axe over his shoulder and went out of the front gate toward the town. "The poor soul, he will meet his death!" Mrs. Kohler wailed. She ran back to her feather bed and hid her face in the pillow. In this second of Willa Cather’s Great Plains Trilogy, we are taken on an adventure of a different kind. For those who are interested in how the creative process grows within a person from young childhood through to adulthood, this book is perfect. 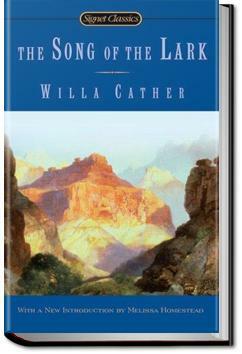 Even though The Song of the Lark is the second installment in “The Prairie Trilogy”, I consider Thea, its strong minded protagonist, the culminating embodiment of the rest of Cather’s feisty heroines, the point where they end up converging to glow in full radiance. We first meet Thea Kronborg through Dr Archie, the young doctor of Moonstone, Colorado. He would become the first of many to have hopes for Thea, Thea the outsider, who just didn't fit somehow in this small town or in the family of a pastor. Sometimes she didn't feel she fit in her own body.